More and more colleges today are making sustainability a prime focus. From constructing LEED-certified campus buildings to reducing waste, sustainability is a hot topic in higher education. Here’s how an insulation energy audit produces actionable data that schools can use to significantly reduce their energy use while positively impacting their bottom line. In discussions of campus sustainability, reducing energy and greenhouse gas consumption is always a high priority. And with government incentives, independent certification bodies and written commitments from many schools, that’s no surprise. What is surprising is that within these discussions, the topic of mechanical insulation is often absent. According to the College Sustainability Report Card, 64% of colleges and universities made a commitment to reducing carbon emissions in 2011, up from 23% in 2006, and that percentage has only grown since. Mechanical insulation is one of the simplest, most effective ways for any institution to reduce greenhouse gas emissions and save energy. Most higher education institutions have a sustainability office or committee that spearheads sustainability efforts, yet many of these committees are uneducated about the positive impact the proper mechanical insulation can have on a college’s energy consumption. How Do Insulation Energy Audits Help Colleges and Universities? Because insulation is essential for sustainable building design, many colleges and university buildings are already equipped with at least partial mechanical insulation systems. But because of the lack of focus and education around the impact of insulation on energy savings, the existing insulation is often incomplete or not maintained. Why? As anyone who works in higher education knows, maintenance professionals and physical plant staff have huge demands on their time. A lack of education about the importance of insulation leads to other initiatives taking priority in the staff’s maintenance schedule. This leads to a greatly reduced capacity for the insulation to do its job of reducing emissions and saving energy. Consider these infrared images taken at a school in Chittenden County, Vermont. Pictured here are sections of uninsulated pipe. The infrared imaging shows just how much heat and energy is radiating off of this system whenever it is in operation. If this system was insulated, this heat and energy loss would be prevented. 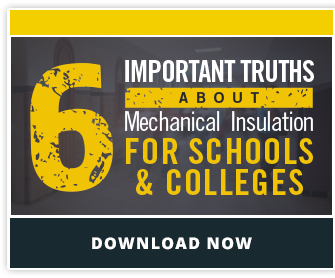 Armed with the real data and hard facts of the insulation audit, school sustainability advocates can push for a greater focus on insulating mechanical systems and creating a maintenance schedule that aligns with the overall sustainability goals.